Juaneice Jackson, a junior on the Grace College women’s basketball team, was recognized as a NCCAA All American (first team) during the NCCAA National Championships, which were held over the weekend at Grace. Presenting her with a plaque is Roy Mulholland, NCCAA Division I Women’s Basketball Chair (and women’s basketball coach at Greenville College. Juaneice also earned national honors from the NAIA with a Second Team All-American award. 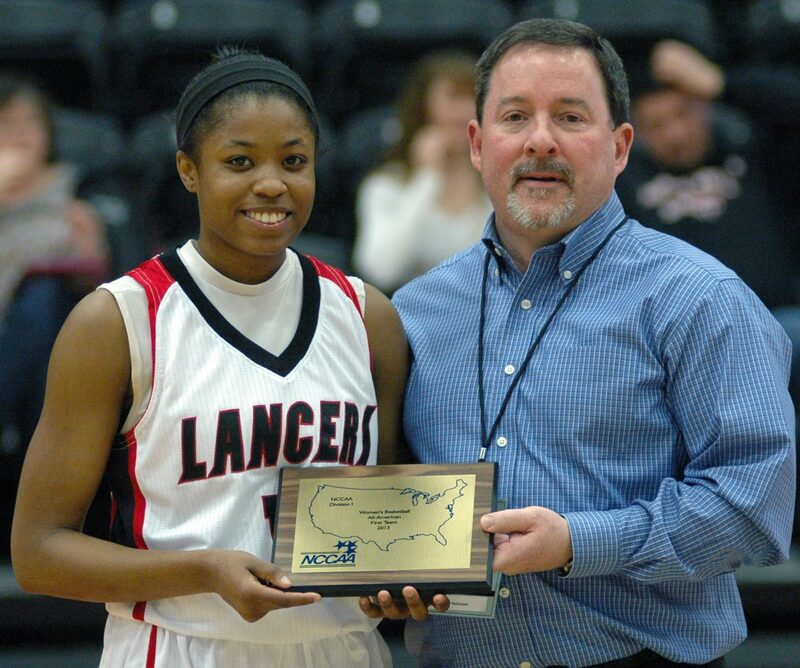 To cap off her tremendous 2012-13 campaign, Juaneice Jackson earned national accolades from both the NAIA and NCCAA. Jackson became the first Grace women’s basketball player to earn national honors from the NAIA with her Second Team All-American award from the NAIA to go along with an NCCAA First Team All-American honor. Jackson rewrote the record books during her junior season, averaging 18.5 points per game in leading Grace’s offense. She recorded the most total points in a season (665) and eclipsed 1,000 career points on Jan. 31. For the season, Jackson set the record for the most field goals made and attempted and the most 3-pointers made in program history. Her 239 made field goals shattered the previous record of 196 held by Cheryl Myers in 1991-92. She also drilled 74 shots from the 3-point line to top Amy Mitchell’s mark of 68 treys in 1994-95. So far in her three-year career, Jackson has amassed 1,244 points which ranks No. 7 for Grace’s all-time leading scorers. Tracie Mezera (2000-04) is Grace’s top scorer in the record books with 1,632 points. Jackson picked up First Team All-Crossroads League honors at the conclusion of the regular season. She was also a two-time NCCAA Player of the Week and a three-time Crossroads League Player of the Week.